Last Sunday we met our friends Alice and Wendy for brunch at a wonderful restaurant, housed in an old hacienda near the Parque Juarez. The setting was lovely and the food was delicious. 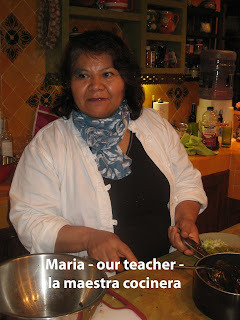 All of us love to cook, so on impulse, we introduced ourselves to Maria Rodriquez, the cook, and asked if she would be willing to teach us some of her traditional Mexican dishes. To our delight, she accepted our offer! 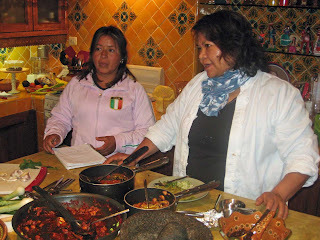 On Wednesday, eight of us gathered in my cocina (kitchen) to learn authentic dishes from a real Mexican cook. 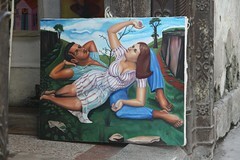 Our biggest obstacle was not our unwillingness but our inability to speak Spanish. She spoke no English, but luckily, body language and gesture were great communicators! 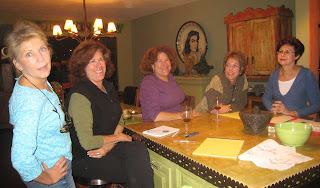 We watched, observed, took notes, (and drank wine at the same time) and within two hours, we were enjoying tastings of delicious dishes, using ingredient that many of us had never used. I thought it would be fun to share the recipes with you, since most of the ingredients are available everywhere. Now you can create the tastes and smells of Maria’s cuisine in your own kitchen! 1. In medium-hot dry pan, toast 5 chile pasillas. After softened, remove veins and seeds and crumble. Add water (enough to cover chiles), let sit for a few minutes and then strain, reserving water. 2. In same pan roast 6 tomatillos until skins are slightly charred. 3. 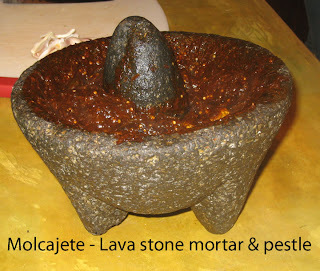 Pulverize one garlic clove in molcajete, a three-legged lava stone bowl with a tear-shaped lava stone used for crushing herbs, chiles, etc – a Mexican mortar and pestle. You can always use a Cuisinart, but somehow it’s not as authentic! Add chiles and mash, pushing in a circular motion. Add generous tsp. of salt and grind, grind, grind! Add a little of reserved water and keep mashing. Add tomatillos, which are now cooked and soft, and mash into the chilies one at a time. To use: Add water, garlic, onion to chile pasilla. Saute chicken breast or shrimp in oil and simmer in the salsa. 1. In dry, medium- hot pan toast 6-7 ancho chiles. (Fresh are called cascabel). 2. Add 5-6 tomatillos to the pan and toast. 3. Devein and crumble chiles and soak in water for 1 minute. 4. Add chiles (save the water) and garlic clove to blender. 5. Add 1 cup of reserved water, roasted tomatillos and 2 tsp. of salt. 6. In frying pan, sauté 2 Tb. onion, add 4 eggs, whisked, and scramble. Add a dash of salt to egg mixture. 7. To the cooked eggs, add the chile salsa and cooked pinto beans, flor de mayo. (They are cooked in water to cover, with a little garlic, for 45 minutes or until tender). Add a handful of chopped cilantro. You may need to add 1/3+ cup water to the sauce. To correct seasonings, test on the side of your hand. Serve with finely chopped onion and cilantro. Slice the cleaned paddles into strips. Add to small saucepan and boil for a few minutes and drain. Add cilantro, garlic and green onion. or make a tinfoil packet of strips of cactus (soak in water briefly), cilantro, onion, garlic, and salt. Seal and let steam in dry frying pan with the tomatillos. 1.Chop handful of mushrooms, onion to taste and 2 garlic cloves. 2. Saute onions and garlic in little oil. Add mushrooms, 4 leaves of epizote, 1 tsp of salt, and 2 chopped tomatoes. Cook until soft. 1. Roast 5-6 poblano (fresh, dark green, mild) chiles directly over a flame, turning until skin is blacken on all sides. Put in paper or plastic bag to help steam off skins. Let cool and peel off skins under running water. Seed and pull off veins. Cut into thin strips. 2. Saute 1/2 onion and 2 cloves of garlic in a little oil. Add 2-3 chopped tomatoes. Add chiles. Cover and simmer for 5-10 minutes. Saute chicken, meat, vegetables or shrimp and simmer in the sauce.